Set at the confluence of two rivers that almost surround the town, and beneath a temple-topped hill, Luang Prabang is a wonderful patchwork of traditional Lao wooden houses and hints of European architecture; reminders of when Laos was part of the French colony of Indochine. 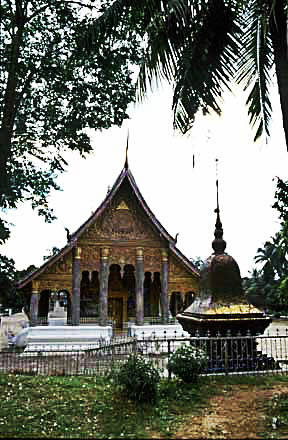 Golden-roofed wats, decorated with mosaics and murals of the life of Buddha, sit under the gaze of wrap-around teak balconies and 19th century shuttered windows. All of this is set against a backdrop of verdant greenery and rugged mountains. One of those small cities with atmospheric and charming personalities, Luang Prabang is now on the radar screen of most tourists who have been or dream of going to Venice, Salzburg, Dubrovnik, Ubod, Hoi An, Cuzco, San Miguel Allende, Guanajuato, Puebla, Morelia, Oaxaca, Napier, Santorini, or Santa Barbara. 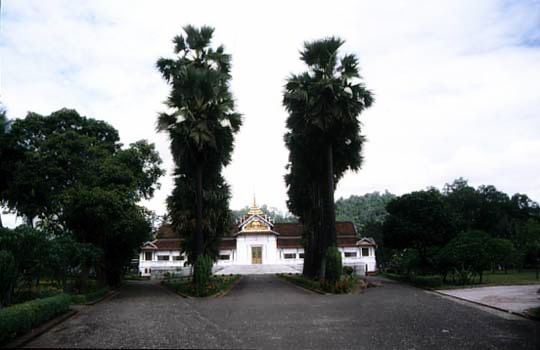 Luang Prabang features a tropical wet and dry climate (Aw) under the Köppen climate classification. While the city is generally very warm throughout the year, it is noticeably cooler during December and January. 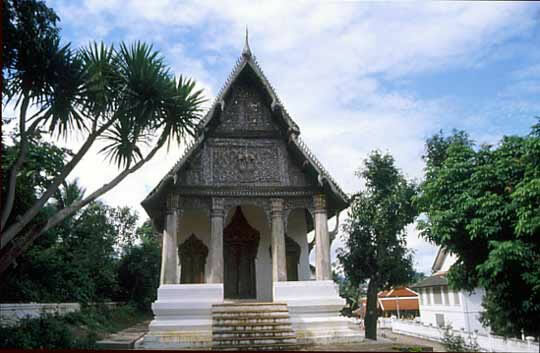 Luang Prabang also experiences wet and dry seasons, with the wet season from April until October, and the dry season during the remaining five months. The city receives approximately 1,450 millimetres (57 in) of precipitation annually. The airport is just north of town and has scheduled flights from/to Bangkok, Chiang Mai, Hanoi, Jinghong, Pakse, Siem Reap and Vientiane. 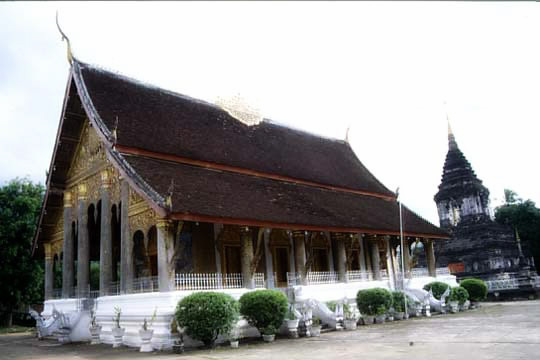 Lao Central Airlines flies daily from Vientiane for around USD 60 one-way. 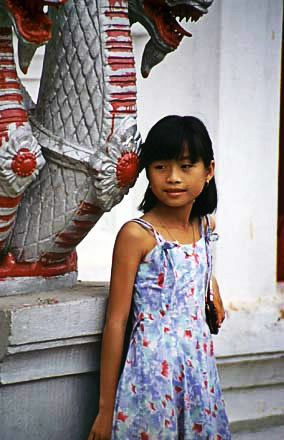 Vietnam Airlines offers flights from/to Hanoi and Siem Reap. Vietnam Airlines’ pricing scheme is somewhat questionable, with tourists paying higher prices on last-minute tickets. Visa-on-Arrival is available at the airport. The price is variable based upon your nationality, with an additional USD processing fee. You need a passport picture to obtain a visa. If you don’t have one, they’ll scan your picture from your passport and charge you an additional USD 1. Ensure you have USD otherwise you will need to use the ATM outside the front entrance or exchange money at the exchange counter. Exchange rates at the airport are reasonably competitive with the prevailing outside rates, unlike a lot of other international airports. Visa extensions are possible at the Immigration Office opposite the Rama Hotel. The price is USD2/day plus a USD2 form fee. The process is very easy; turn up in the morning with your passport and one photo; fill in a form (in Luang Prabang they do this for you) and come back in the afternoon for your extension. Taxis into town cost about USD 6, whether you are by yourself or with 3 other people. There is a taxi counter just outside the arrival hall. There are tuk-tuks driving down the main road which charge about 20,000 kip (USD 3) for one person into town. If there are a couple of you then you can get a better price. 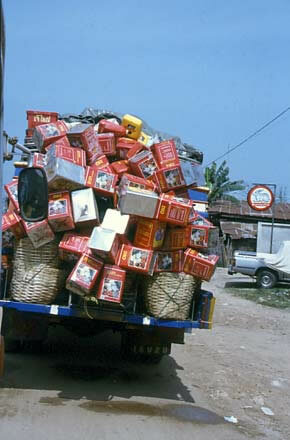 Most guesthouses can organize pickups for about 100,000 kip. From Hanoi, Vietnam, one could take a 30 hour bus for VND 850,000 (December 2013) to Luang Prabang. Just ask any travel agency or hotel receptionist, not many offer this service, but you can find it if you try hard enough. Upon arrival at a bus station, there will be tuk-tuks that will cram in as many tourists as possible for a flat 20,000 kip (10,000 kip after negotiation and pointing to the information panel from the bus station displaying the tuk-tuk fees for the city-centre, feb 2015) to the city centre, which is near the Royal Palace. Many tourists alight here, but if your hotel is not nearby you can request that the driver take you to your hotel at no extra charge, as long as it’s within the historic part of the city. There are three bus stations, each a little bit out of town, which serve different directions. Tuk-tuk drivers know which bus station to go to for which destination. Ask around for bus schedules. Tickets can be bought at every travel agent in town, which makes more sense than buying them at the bus station as there is only a difference of roughly 20,000 kip, which pays for the the tuk-tuk from place of accommodation to the bus station (impossible to walk), so it nullifies the gain. Pick those agencies which absorb the shuttle ride from the fare quote as others do not. Compare first before biting the quote. Book tickets in advance, particularly for “VIP” buses as they have reserved seats, and you don’t want to end up sitting next to the toilet. If you have a preference for aisle or window seat, ask for a seat before the toilet (i.e., between the toilet and front of the VIP bus) where the seat numbers are predictable. The seat numbering jumps a couple seats after the toilet (which is located in the middle left of the bus), and what should have been an aisle seat number becomes a window seat number and vice versa. Boats ply the Mekong to and from Huay Xai at the Thai border, stopping in Pakbeng where you can catch overland connections towards the northeast and the border with China. The trip takes 2 days (both days about 9 hours) by slow boat, or 6 bone-rattling hours by speedboat. There are also operators now offering 2-day “luxury” cruises. Expect to spend the night in Pakbeng if you’re taking a slow boat (the safest option), or to arrive in Luang Prabang deaf, shaken and either exhausted or exhilarated from six hours in a speedboat. There is also a twice-weekly “one day comfortable boat” between Luang Prabang and Huay Xai, but the cost is significantly higher. Slow boats leave every day, the last one at 11:00 (if there are enough people [who are slow getting through Laos immigration] boats will leave up until approx 12:30). Make sure you stock up on food and drink before travelling as the on board prices are practically double. Many guest houses at Pakbeng sell small, but somewhat pricey, packed lunches for the onward journey. In Huay Xai take a tuk-tuk from the border crossing to the boat landing (10km, THB 100 per passenger) and purchase your tickets at the boat landing because all the tour agencies in town charge a commission, and agents usually don’t have reliable information about the quality of the boats. 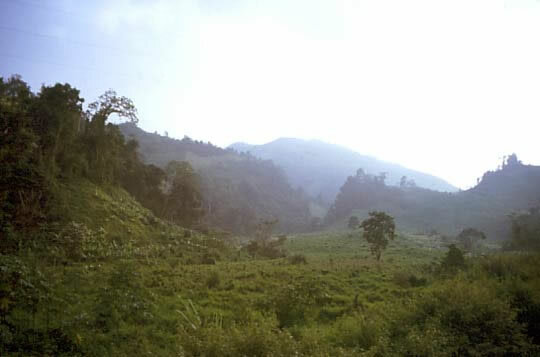 It is common to have to switch to a different boat in Pakbeng, so you may end up in a boat of higher or lower quality for the second half of the journey. The two day boats have nice comfortable car seats, and so it is no longer necessary to purchase any cushions. You can buy a Huay Xai to Luang Prabang ticket from Huay Xai guesthouses but at the Port you can only buy a ticket to Pakbeng. When you board the Luang Prabang boat after the night in Pakbeng, a registered ticket seller will come around checking ‘through’ tickets and selling tickets for that day’s travel to LP. The slow-boat is generally packed, so much so that there may not be enough seats to go round. If you insist before leaving, plastic chairs may be added for the benefit of the unlucky late-comers. Arriving early will mean a longer day, but most likely a better seat, towards the front and away from the incredibly loud engine (maybe take ear-plugs just in case). The best seats are located near the captain as they allow access to large open ‘doors’, however, this area can get cramped with locals and their belongings or alternatively with shouting, Samsong-drinking party-backpackers while the few locals are shoved in the back. Please consider to give up or at least share your seats for the elderly. The slow boat trip proceeds at a pleasant 20-30km/h and offers nice views to the nature and village life on the banks of the Mekong river. Most of the passengers are foreign tourists. Occasional locals take the boat only for short hops between the river side villages, but prefer to take the bus for the full distance from Huay Xai to Luang Prabang. So you won’t be able to observe many local boat travellers, the boat ride offers just the usual sight of tourists drinking Beerlao but is a great way to meet other tourists and discuss route plans and travel info or get very sick of them. When you disembark the slow boat it is a very steep combination of stairs and earthen bank to the road. A tourist fell backwards with the weight of her backpack and broke her leg in May 2015. You might be approached by a tout offering to take you into town for a very inflated price. What he’s doing is very dishonest as he will carry your backpack to the road and then demand payment, and then you still have to buy your 20,000 kip tuk tuk ticket at the office on the road to get into town. 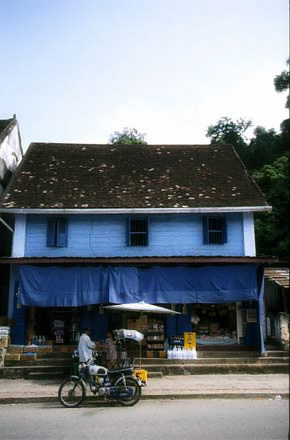 There is an agency (Bo-Sapphire) in Huay Xai which offers trips from Chiang Mai to Luang Prabang. Tickets which are sold by local agencies and hotels in Chiang May include minibus transfer to Chiang Khong (Thai bank), border/Mekong crossing to Huay Xai and the slow boat ride as described above. Tickets are collected by the driver when you enter the minibus in Chiang Mai and you will be left with no proof of payment and services included. The minibus will drop you at a very dirty “hotel” in Chiang Khong with damaged buildings, urine-stained bedsheets, and disgusting meals. Consider walking around town to find a better place. If you book the “B” package which includes accommodation in Pakbeng you will find that breakfast, lunch package, and transfer to the pier is not included although you paid for it but are not able to prove. Phone numbers and email address displayed on the company’s stand at Huay Xai immigration counter and on their buses are defunct. So you cannot contact them. If you choose to travel on the speedboat (a light canoe with a very powerful engine), a crash helmet and life-jacket will be provided, but once you have taken the trip you will realize they are mostly show only and will not help you if something goes wrong. Regardless, it is not recommended you travel in a speedboat without this safety equipment. It is also recommended that you make your bags as waterproof/water-resistant as possible and wear a rain jacket. The boat can generate quite a bit of spray, plus any showers you might encounter along the way will sting like needles against any exposed skin. On sunny days, sunscreen is invaluable as there is no roof/shade on these speed machines. The journey to Huay Xai can be reduced to as few as 4 hours in the wet season, with a lunch stop at Pakbeng. However, some consider this means of transportation less safe, especially in the dry season when boats travelling at 80km/h come within a few metres of exposed rocks. Earplugs are strongly recommended. Those concerned about their environmental impact may want avoid speedboats, as they are heavier polluters than the slower options. Speedboats run on LPG with boats stopping regularly to get supplies (8 bottles required per trip) and it is not overly comforting to the weak-hearted to have two full bottles at the front of your boat as you negotiate 3m diameter whirlpools to avoid m rocky outcrops almost close enough to touch. Travel agents in Luang Prabang will sell the tickets for 320,000-370,000 kip, you will need a minivan to take you the 10km north to the fast boat pier. Unless you’re an adrenalin junky, look for other transport options. The third option is to take a “luxury” cruise. The major operators are Luang Say and Nagi of Mekong. Both operate two-day cruises to Hauy Xai that stop in Pakbeng for the night. A third player, Shompoo Cruise, has now entered the market. Although the journey takes as long as taking the slow boat, these operators offer vastly superior facilities and equipment than public slow boats, and you should be prepared to pay a premium for it. Tickets for all three operators can be bought at most travel agents in town. 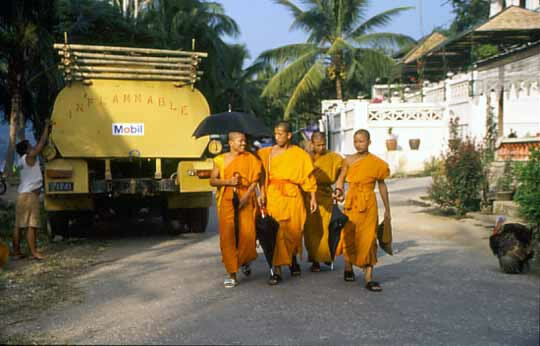 Alms ceremony — monks at dawn (05:30) collecting alms of rice from kneeling villagers and tourists, who form the majority, along Sakkaline Road near Wat Sensoukharam. Just look for the long row of rice baskets and stools that have been laid out for tourists who have paid for the privilege of giving alms. Seeing these tourists, who make up the majority of the alms-givers, seated on plastic stools participating out of fun rather than sincerity definitely reduces the authenticity of the moment. To make things worse, some are dressed inappropriately: please, if you want to give alms, at least cover up and do not show the monks your cleavage. If you are white, please keep a distance from the monks so people can take authentic photos without a European backpacker getting in the way. Ask your guest house host to assist you the day before in preparing if you’d like to get up and give alms in the morning. Please note that the alms giving ceremony is one which, while picturesque, is not without its detractors. Unscrupulous local merchants have used the eagerness of tourists to participate in a local tradition as a means of making easy money, and sometimes sell unsuitable, stale and even unsafe food. 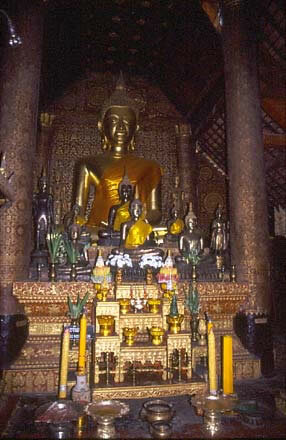 This has resulted in monks falling ill after having consumed the offerings, and resistance to continuing the tradition. However, the government has made it clear that the monks have to continue the tourist pageant or risk being replaced with lay people clothed in saffron robes in order to keep up appearances, and thereby maintain tourist revenue. So if you wish to participate in this ceremony, prepare the food or fruit yourself, and avoid giving food of unknown quality. Another problem is the photography: while it looks nice on your collection, think about how it must feel for the monks to have hundreds of tourists photographing them every day. Some lowlifes even stand right next to them, flashing them in the eyes. Strongly consider only watching this old tradition from a distance instead of using it as a tourist attraction, as this may detract from the beauty of the ritual – both for locals and tourists alike. You can always download a picture of it somewhere on the net for your collection. Haw Kham The former royal palace and now national museum, no photo/video/bag/shoes allowed, free locker. Open 08:00-11:30 and 13:30-16:00 every day except Tuesday. There’s also sometimes local drama or dance performances in the adjacent theatre. Phou Si/Chomsy Hill — the main hill in the city from which you have a good view of the whole area. It’s not a very steep climb from the bottom and sunrise and sunset are the most sensible and rewarding times to go up. There is a near-panoramic view from the top. There are 2 entrances from ground level: 1 on the north along Sisavangvong Road, facing the Royal Palace, and another one on the East, on Sisavang Vatthana Road. The northern entrance has about 130 steps up to the ticket counter, and another 190 steps to the top. Even folks with low fitness levels should be able to complete the climb, although it can be tiring for the unfit. The eastern entrance is longer than the northern one by a factor of 2 or 3, and is hence less steep and has more points of interest along the way, which are perfect excuses for stopping for a breather on the climb. Vat Xieng Toung — the oldest monastery in town and one of the most beautiful. Opens from 06:00-18:00. One entrance on the road along Mekong river, the other on the by-lane off the main road. Elephant Village Sanctuary & Resort, Ban Xieng Lom (Office on the main road, Sisavangvong Road), ☎ +856 71 252417 (elephantvillagelpq@gmail.com), 07:00-21:00. Ensures the support and survival of (currently) 14 elephants. They are kept away from abusive work and cared by professional veterinarians. They make sure that the elephants are well cared for and they seem to be very well looked after. You can do basic elephant rides, or 1 or 2 day mahout course where you learn the commands to control the elephant. You also get to wash it in the Namkhan River which is a lot of fun. Nam Ou Elephant Farm, Ban Pak Ou (Close to Pak Ou Caves, on the bank of the Nam Ou River), ☎ 20 22 350 157 (info@luangprabangelephantcamp.com). 07:00-21:00. The Nam Ou Elephant Farm is a Sanctuary for the beautiful Asian elephants and a place where people can come and have a life changing experience with these Magnificent Mammals. With a connection with Sayaboury Elephant Conservation Centre, two of the Mahouts were trained by the centre, the farm has become a conservation and welfare centre for the elephants. There, people will get the opportunity to learn about the Asian elephants, feed them & ride them. There are strict controls in place including no more than 1 hour per ride with a maximum of 2 persons on 1 elephant; and note the farm restrict rides to a maximum of 2 trips per day per elephant. Kuang Si Butterfly Park, (300m before Kuang Si Waterfalls), ☎ +856 20 9823 7466. 10:00-17:00. Opened in January 2014. Total of 2,800m² of landscaped gardens, orchids, 900m² of netted butterfly garden, free natural fish spa (those little nibbling fish that feed on your skin), European bakery, good coffee/tea. Best visit on sunny days. Kuang Si Falls. 08:00-17:30. 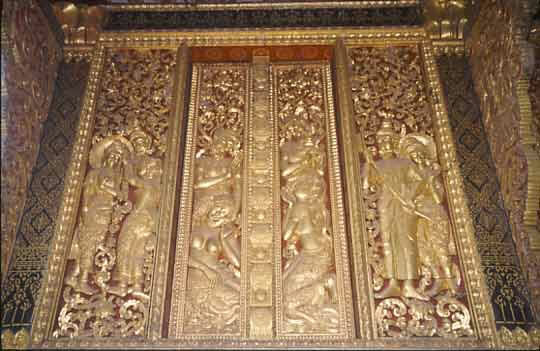 A large multi-stage waterfall, accessible by boat or truck hire, some 29km south of Luang Prabang. You can rent a motorbike to transport yourself there. Parking your bike at the entrance costs 2000 kip. There are food and tourist stalls outside the waterfalls. It is worth putting a whole day or more aside for seeing this because it is a great place to relax and meet others. There are multiple pools at different levels, all of which are reportedly safe to bathe in, and are extremely picturesque. Shared tuk-tuks to go there charge about 30 to 50,000 kip. The cheapest seems to be near slow boat pier, though you can get them for 40,000 kip near JoMa Bakery. You may have to wait until the tuk-tuk fills up. Tuk-tuks are legally only allowed to take six people, and there is a checkpoint at the falls, so some drivers may try to get a 7th person in the front seat. A private tuk-tuk will cost you around 150,000 kip after some haggling. Drivers will try to show you some documents that quote 200,000 kip or more. Ignore it and insist on your price. Try and go with 5 people and insist on 30,000 kip each. Drivers should wait for 3-4 hours for you at the waterfall gate area. Make sure includes transport there and back. Bargain, bargain, bargain. Just remember that there are dozens of tuk-tuks around, so you have the advantage. If on your own, propose 40,000 kip, and if you have the patience wait until he finds more people. Be careful of leeches in the water, especially if you climb to the top of the top of the falls. There is a lot of leeches in the water. Pak Ou Caves. The famous “Buddha caves” are north of town on the Mekong and can be reached by road (approx 1h) or river boat (around 1.5h). Alternatively, you can hire canoes and a guide for the day, which will allow you to view the beautiful scenery and visit the caves without throngs of other tourists. 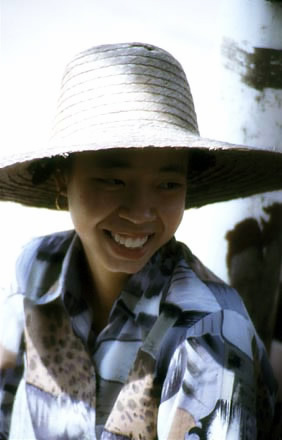 It’s also possible to finish the trip at the “whisky village” where the local Laolao rice spirit is made. Those caves were used as a storage unit to keep the damaged Buddha statues (it is considered bad luck to throw them away, so they are often stored in caves) and were made a tourist attraction; if you ever been to any cave before, it is not worth a dedicated visit as you’re likely to be disappointed. There are two caves: one on the entry level and another, the upper caves, on top of the hill, a very steep climb. A torch is recommended to see the upper cave, and will be given on entrance. Ticket for a round boat tour to Pak Ou Caves (with stop at the whisky village) costs 65,000 kip (Jan. 2015) per person and can be purchased at the pier (first boat takes off at 8.30 am but the ticket office is open at 8). If you book a “half-day tour Pak Ou” at the local tourist office, make sure if the entrance fee is included in the price, or the whole “service” to be provided is just selling you a boat ticket with surcharge; in the latter case, just go to the pier (at Mekong river, easy to find) and buy the tickets yourself. Simply cross the river for for 3,000-5,000 kip, walk up the hill and turn to the right crossing the primary schools to find your way to the caves. Tad Sae Waterfalls. Stepped waterfalls which are not as big as Kuang Si, but very beautiful. You can bathe there, and elephant rides are also available. Though the most people stop at the main waterfalls near the entrance, you can walk alongside the streams for couple of miles and find more waterfalls. You must take a river boat 10,000 kip per person (each way) to reach the place. Motorbike/Bicycle parking is 5,000 kip. If arriving by motorbike from Luang Prabang, get on route 13 south (towards Vientiane), and there will be a left turn after the 372 kilometre highway marker, right after a petrol station. There isn’t much of a sign; if you reach the 371 kilometre highway marker, you’ve gone too far. Zip-line next to Tad Sae Waterfalls, A 20 platform zip line, total length of all segments of which is claimed to be over 1000 m in length. Located next to Tad Sae Waterfalls. The price is from May 2013: USD35. Tad Thong Waterfall and Nature Trail, (6 km from town centre, off Route 13 south to Vientiane). The waterfalls are not as spectacular as the Kuang Si but there is a paved 50 minute walk through the jungle through a forest of huge trees dotted with picnic areas. Closed for many years but now open. Water from the falls cascades into a big lake that you can swim in. A natural location with not many tourists, but there is a restaurant. Go by tuk-tuk, minivan, or rent a scooter or bicycle. The last 2.8km of the road there is unpaved, quite rocky and a little steep in places, so if you’re driving on your own, make sure you’re comfortable off road. Note: as of August 2014, some of the pathways are in a bad state of disrepair and/or flooded, and you will need to get your feet wet at least once to get to the end of the path. The Terrace, Kingitsarath Road (on the Nam Khan River, in front of Burasari Heritage Hotel). 07:00-10:00. Lovely restaurant with full river view in a classy, elegant setting. Extensive menu offers delicious Thai and Lao dishes, large portions and reasonably priced wine by the bottle. The ambience in the evening is beautiful. Elephant Blanc, Rue Chao Fa Ngum (in Maison Souvannaphoum Hotel, across from the Nam Phou Fountain), ☎ +856 71 254 609. Menu features delicious Thai, Lao and Western dishes in historic Maison Souvannaphoum Hotel, a French colonial building once the home of the Prince. Lovely ambience surrounded by tropical garden. Open for lunch and dinner. Excellent friendly service. Sometimes they do a 10-dish Lao tasting menu with a performance of traditional Lao music and dance. 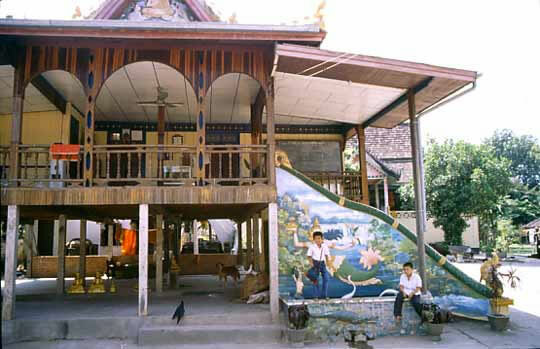 Tangor, Rue Sisavangvong (on the main street). Asian food and regional flavours with a French twist. Tangor has a prime location on the main street. The menu is small but excellent and fresh. Try their signature ceviche. A selection of imported beers, nice cocktails, wine by the glass, great Indochina decor and ambience. Cafe de Laos, Main Street (beside Wat Sene, opposite Scandanavian Bakery). 06:00-18:00. Cute cafe with a huge range of coffee beans all grown in Laos. The only place in Luang Prabang to have siphon-brewed coffee. They also serve good value breakfast sets and lunch, cold drinks, TWG tea. Great location on the main street beside the temples. Free WiFi. Opera House Restaurant/Wine bar, Shakarin road (on the main street, 100 m after night market). 14:00-23:30. The lao-Italian cuisine very good,try thier meatball with lemongrass or Lasagna prepare by Italian chef are so yummy. A good spot to sit on the terrace or street-side tables and enjoy a drink while watching people go by on the main street.A lot of choices for Wine or cocktail drinks, Good service and friendly staff. Nang Ae Restaurant (ຮ້ານອາຫານ ນາງແອ), Opposite to Dara Market (Right at the corner of the busy Dara Market intersection). 05:30 to 20:00. – There is no written English name but very easy to spot since it located right at the intersection opposite to Dara Market. Local restaurant, very good Lao/Thai “fast food” and sandwiches at fair prices. English menu available. Try their omelet over rice and noodle soup. Delilah’s – Chao Fa Ngum road, Two blocks from post office.across the street from Vat Hosian Voravihane. Delilahs offers fair prices, delicious food, and monthly specials- head on up to the second floor for comfy seating. English spoken and polite attentive service. Le Banneton – Opposite Wat Sop, Sisavangvong Road. Authentic French bread, tarts, pastries and cakes. Their pain au chocolate is buttery and delicious. The tarte citron is divine. Prices are in the upper range but you get what you pay for. Big Tree Cafe – Consistently well-prepared Western food and authentic Korean food. Under the big tree on the Mekong River. Good service and free Wi-Fi. Dyen Sabai, Ban Phan Louang | PO BOX 805, Luang Prabang 06000, Laos, ☎ +856 20 55 104 817. High Season 0800-2300, Low Season 1200-2300.Asian and Laos food. 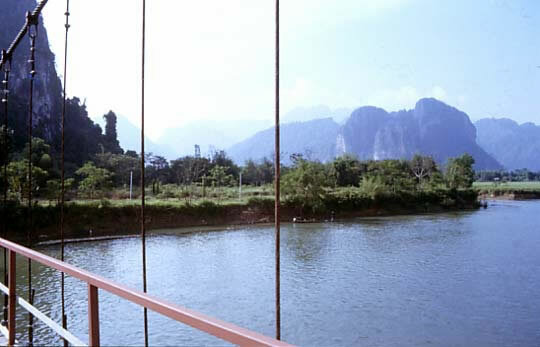 Try the Laos Tasting Platters or Barbecue (Sindad) and enjoy the view of the Nam Khan river from the bamboo garden. With a variety of seating, good music, Free WIFI and board games. Boulevard Restaurant, ☎ 071 25 48 81. A new al fresco-style restaurant under the same wing of New Daraphet Villa behind JoMa Bakery. For those wishing a quiet meal be warned the owner has recently brought in sound equipment and a new acoustic guitar for music enthusiasts to jam. The restaurant has 2 sides for both proper dining and casual drinking. Serves decent draught Tiger beer and a good atmosphere. L’Eléphant– Around the corner from Saffron Cafe. A lovely restaurant with a unique mix of Laotian and French cuisine. The food is extremely good, but has its price. It is directly in front of a small guest house, and not far away from Les 3 Nagas hotel and Villa Santi Hotel. The ingredients are of the highest quality, ranging from French Camembert to Laotian lemon grass and river weeds. Has a great ambience, but the menu is both pricey and some items do not justify their price tag. Hmong Night Market (Vegetarian + Vegan) – One food stall says vegetarian and the other “végétalien” (vegan). Approximately 5,000 kip for a plate. Popular with budget visitors but not an option for those looking for tasty food. Cash only. Eat at your own risk as hygiene standards are questionable. Market is open 17:00-22:00. Joma Bakery Cafe, (Near the post office at the end of the night market. ), ☎ 071-252-292. 07:00-21:00. The best cafe in Luang Prabang (doubtful). Enjoy their original Bagel Egger (bagel, egg, ham, cheese and mayo), Nanaimo bars, Oat French Toast, the best Reuben in SE Asia and best coffee in Lao. Offers free Wi-Fi, air-con on both floors and free full-menu delivery service from 07:00-19:30. Great music and very friendly staff. Overly expensive Starbucks copycat, lacking the distinctive charm of many other cafes in Luang Prabang. 8,000- 43,000 kip..
Lao Lao Garden – Attractively designed bar/restaraunt notable for its Lao-style barbecue, in which you and your friends cook pre-prepared meat on a barbecue mounted in the centre of the table. A backpacker favourite and becomes busy in the evenings with loud club music. If you prefer to cook your barbecue in an atmosphere of quiet contemplation there are other BBQ options along the riverside. Nava Mekong Dining Cruise – Nava Mekong is the exquisite dinning cruise of Luang Prabang. Dining on the on the side of the mighty Mekong is a recommended thing to do when visiting Luang Prabang. Pizza Phan Luang, (50m up the road from Dyen Sabai across the bamboo bridge/free river crossing), ☎ 020-5692-2529. 17:00 to 22:00, Tues. – Sun.. Comfort food at its best, Pizza Phan Luang is a new comer to Luang Prabang (opened in Jan. 2013) serving up thin and crispy pizza in their wood fired stone oven, since Sassa closed in 2011 they are one of two dedicated pizzerias. The menu is intentionally simple and in-season fruit are provided after the main. The owners are passionate about food and prepare their own dough daily. The resident cat strangely does not eat pizza. 40,000 – 60,000 kip. for a large pizza..
Un Petit Nid – Biblio Bistro. Very relaxing bistro serving excellent Lao and Western food in nice atmosphere. Watch out for the kittens. Try the Orlam with spicy wood. Good vegetarian menu. Rosella Fusion Restaurant – Clean and well-cooked food. A small place (blink, and you’ll miss it) that looks like a fruit shake place. Locally owned by a Lao who trained at Amantaka Restaurant. Possibly the best steaks in town, certainly great cocktails. Slow service, but worth it. Saffron Café – (around the corner from L’Elephant restaurant in Wat Nong village) – The best coffee in Luang Prabang, which comes from the surrounding mountains. The banana shake macchiato is also recommended. Delicious fresh baked goods such as their cinnamon swirls and banana muffins go quickly. The granola and salad wraps are good. Scandinavian Bakery– Serves Western quality breakfasts, burgers and pizzas. Food must be paid for before eating. Delicious Italian-style pizzas. Shakes & Crepes– a no name place serving delicious shakes for 5,000 kip and fantastic sweet crepes starting from 7,000 kip. In front of Croissant d’Or on the main street. Tamarind – On the banks of the Nam Khan river next door to Apsara, specialises in introducing Western tourists to Lao food, so the dishes are offered with explanations and the menu is full of information. Traditional Lao food in sampler format. Platter combinations of dips,salads etc as well as set menus. Only a small wine list but good range of fruit drinks. Popular cooking classes in a garden setting. Sells food products, recipe books etc. Viewpoint café and restaurant, Mekong Riverside Road, Xieng Thong Villag (Next to Mekong river view hotel), ☎ +856 (0) 71 25 49 00 (viewpointcafe@mekongriverview.com). Viewpoint café offers you a fantastic view added to your breakfast, lunch and dinner. It is easy to eat a long breakfast in silence here and in the dinner at night the place has changed and gives you a cozy place with palm trees as your roof. High quality Lao and Western food. 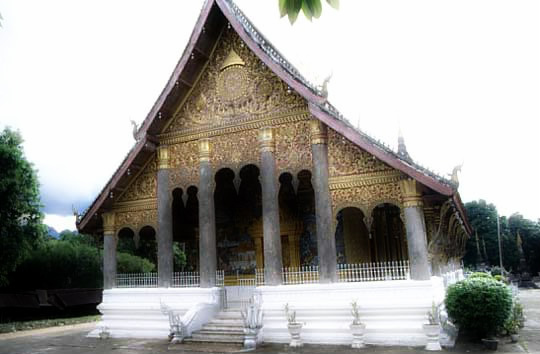 Luang Prabang has the best selection of accommodation in Laos, with something to suit every budget. There is everything from tent sites under a roof for 20,000 Kip per night up to super luxury hotels at USD 1,500 per night. Don’t expect all the facilities that can be found in Vietnam or Cambodia – aircon, cable TV, internet – in Luang Prabang for USD 12. While the big chains have yet to make an appearance, there’s plenty of “boutique” accommodation, although this heavily overused word runs the gamut from quirky to luxury. Most of the lanes and alleys all through Luang Prabang have places to stay, with a large selection also found in the lanes south of the Post Office. Free Wi-Fi is quite commonplace in Budget guesthouses.